Hitting the perfect Overhead Backhand Clear is never a simple task. The only thing you need to focus on is generating enough power to hit the shuttle from one end to another. Smart opponents will always force you to use your backhand. They do this by hitting the shuttle towards your backhand area. So it’s very important that you master this shot to get you out of trouble. 1. Quickly switch to the Backhand Grip. Keep your grip loose and relaxed for maximum wrist action. 2. Turn your body to face the rear court. Slightly bend your knees. 3. The picture on the left explains the Backhand Stroke. You raise your elbow as high as possible so that you’ll take the shuttle at a high point. 4. Take the shuttle at the highest point possible. 5. As you hit the shuttle, stomp your Racket Foot on the ground. Place your body weight on your Racket Foot. This creates more power. If you can’t generate enough power for your backhand clears, you’re probably performing the wrong stroke technique. The KEY to hit solid baseline to baseline backhand clears is to performing the correct Overhead Backhand Stroke. Slow in Switching to the Backhand Grip. When hitting Backhand Clears, I rely a lot on finger action. This means using my thumb to push the racket forward. This creates a quick snapping motion of my wrist. So it’s very important that I learn to switch quickly to the Backhand Grip. You can practice this off-court. For example, playing around with your racket while watching TV. When Should You Use the Overhead Badminton Backhand Clear? Only when you’re forced to! When your opponent clears the shuttle to your backhand area, always try to hit it with a Forehand shot. 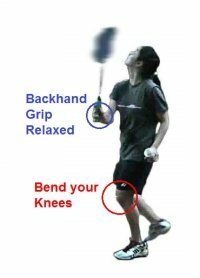 Use the Backhand Clear only when you can’t get into position in time for the Forehand Stroke. hitting more consistent shots with their Forehands. Please Like me on Facebook. Thanks!